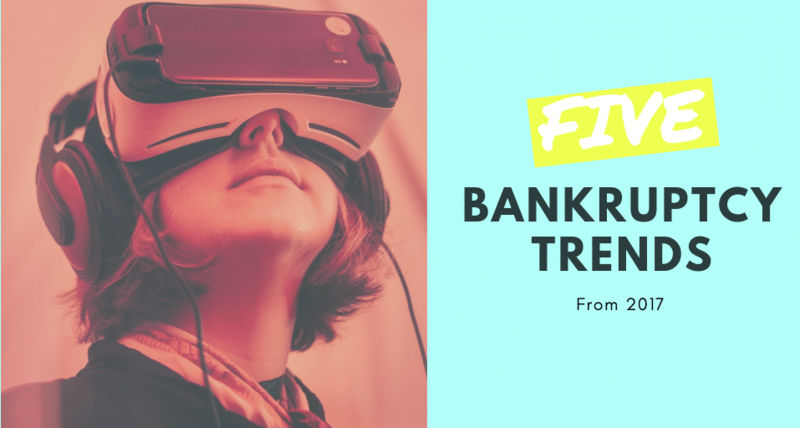 What Five Trends Dominated Bankruptcy Filings in 2017? The Administrative Office of the United States Courts (AOUSC) released the Bankruptcy Abuse Prevention and Consumer Protection Act Report (BAPCPA Report) for 2017. The BAPCPA report provides detailed information on consumer bankruptcy filings during the previous year. There were multiple filing trends in 2017. Unsurprisingly, 62 percent of reported assets in bankruptcy cases included real property, such as a home or condo. The remaining assets were personal properties, such as jewelry or furniture. Northern California and Southern Florida filers had the highest average assets per petition. Bankruptcy is an excellent way to protect your assets from creditors. When you file for bankruptcy, an automatic stay is issued. The stay prevents most creditors from seizing your assets. Remember, bankruptcy is for people who have assets they want to protect. Sixty-one percent of 2017 bankruptcy cases were filed under Chapter 7 while 38 percent were filed under Chapter 13. In addition, less than one percent of consumer bankruptcy cases were filed under Chapter 11. Although Chapter 11 bankruptcy is typically used by businesses, individual consumers with complex assets may also benefit from this filing option. Unsurprisingly, the majority of consumer bankruptcy cases were filed under Chapter 7 and Chapter 13 bankruptcy. Filers in 2017 had a median income of $2,741 per month and a median of $2,645 in monthly expenses. This comes out to roughly $33,000 per year. In 2017, Missouri single-person households reported a median income of slightly more than $49,630. Two-person households reported a median income of $63,754. Unless you are filing as a business (meaning you have mostly business debts) or your income is below the state median for a household of your size, then you must complete the means test to file under Chapter 7. More than 742,000 consumer bankruptcy cases were filed in 2017. According to the AOUSC Report, there were 1 percent more bankruptcy petitions filed in 2016. Chapter 13 bankruptcy allows debtors to repay their creditors through a single repayment plan that lasts for five years. Completion rates for these plans vary considerably, especially in cases where automatic payments are used or required. In 2017, fewer filers completed their Chapter 13 repayment plans. According to the AOUSC Report, only 48 percent of filers completed these plans in 2017. By comparison, 52 percent completed their Chapter 13 repayment plans in 2016. At The Sader Law Firm, we tell our clients that bankruptcy is for people who have something to protect. Bankruptcy is an excellent option for people who are facing insurmountable debts and creditor collection actions. Depending on your situation, you may be able to keep your most important assets while discharging cumbersome debts. You can contact our Kansas City bankruptcy attorneys by calling (816) 281-6349. If you’re more comfortable communicating online, then you can also reach us by using our online contact form. ← Do You Meet the Six Requirements for Public Service Loan Forgiveness?